I am not sure where this river derived its name but the “bueno” portion is very fitting. I first visited the river on December 13, 1997 with John Foss, Josh Lowry and Robbie Dastin. The scenery was spectacular and the boating and camping outstanding. The river is best run during late spring and early summer run off (November to January). I would estimate that ideal flows range from 1000 to 2000 CFS. 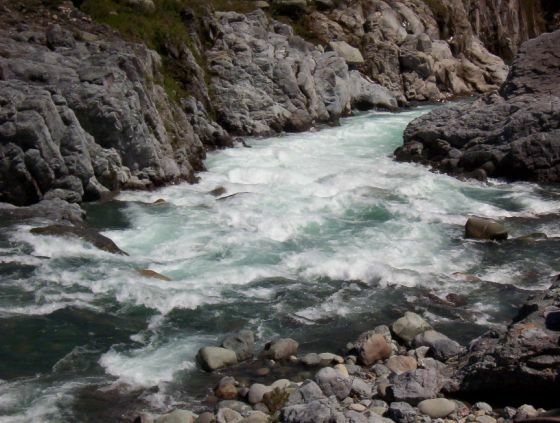 The source of the river is Laguna Achibueno high up near the Argentine border. As the river drops it passes three distinct peaks, Volcan Longaví (3242 meters), La Gloria and Las Animas (the spirits). All three are majestic peaks that also offer premier backcountry skiing. There are two distinct runs. The lower is a class 3-4 10 KM run with road service. The upper class 4-5 section requires boat hiking and is a full day adventure. To reach the take out for the lower takeout leave the Pan American highway at Linares and head east to LLepo (16 km) then continue on to Aduanas El Pejerrey (21 km). Continue upstream several KM and you will come to turn to a bridge crossing at Vado Azul. This is the takeout or you can continue downstream 3 km to get a mini class 5 canyon. 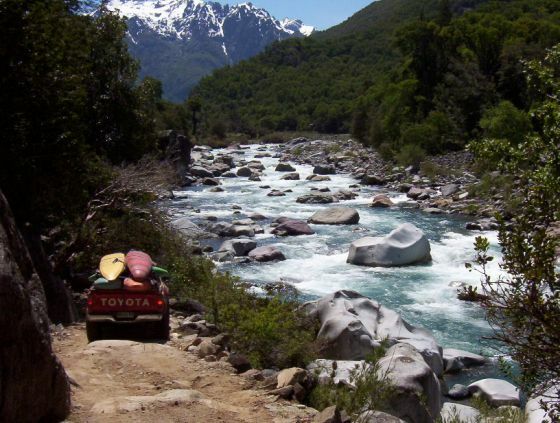 To reach the put in continue upstream 10 KM to La Mula. At this point there is a steep grade down to an animal bridge over the river. This is the lower put in. The run should take several hours and has an average drop of 75 FPM. This is also the takeout for the upper section. The road from this point is extremely poor but if you have a good truck you can continue driving upstream as far as you can get or you can start hiking. To get “the goods” I would estimate 6-7 hours of boat hiking is required. After 3-1/2 hours of hiking from La Mula you will come to Estero Las Animas. Cross the creek and continue on another 1-1/2 hours and you reach Estero La Gloria. There is a house here and it is a good place to camp and/or stash gear. What we did was camp here the first night and continue hiking in the AM. Prior to making camp we hiked up Estero La Gloria and ran a 2 KM stretch which started with class 5 and finished right at our campsite. The following morning we hiked an additional 6 hours upstream. We passed the entrance of the silty, gray Rio Portillo and walked onwards an eventually stopped 30 minutes above the entrance of the Rio de Los Patos on the flanks of Volcan Longaví. The river here was crystal clear and only 400 CFS. In retrospect all this boat hiking could be limited to the 1 km stretch above La Gloria. Here the Achibueno sports continuous, boat-scoutable, class 4-5 rapids with granite boulder gardens resembling some of California’s finest. From 1 KM above La Gloria the run back to La Mula takes 3-4 hours and involves no scouts and no portages. The gradient averages well in excess of 140 FPM and makes for a perfect easy but challenging class 5 run. Note: The classic Ancoa river is less than an hour away. In addition to a run on the Achibueno think about runs on both creeks Las Animas and La Gloria. We paddled a 2 km section on each and found it worth the extra efforts.